I grew up in Nebraska and had a narrow view of �soil� for the first part of my life; soil was the deep, dark loamy stuff that supported the bountiful agriculture of the Corn Belt. When I first came to the Sonoran Desert nearly twenty years ago, I hardly considered that anything deserving the label �soil� existed beneath the desert�s gravelly and rocky surface. I�ve learned so much since then; the soils found throughout the Sonoran Desert are far more varied and complex than any I studied as a college student in the Midwest. Desert soils are downright unusual! They vary tremendously in texture; many are sandy and gravelly, while others contain layers of sticky clay, or even rock-hard, white limy layers. Desert soils may be gray-colored, brown, or even brick red. In the more arid parts of the Sonoran Desert, surfaces of some soils are covered by a layer of small stones that can be as tightly interlocked as pieces of an ancient Roman mosaic, and are coated with dark, shiny rock varnish. Many of these diverse features of desert soils have taken thousands of years or more to form. Characteristics of these soils also greatly affect, and are greatly affected by, desert organisms. The varied geological terrains of the Sonoran Desert provide many different kinds of parent materials in which soils form. 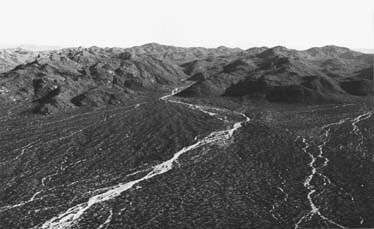 Gravelly or stony alluvial fans that spill out of mountain drainages into adjacent basins cover much of the face of the Sonoran Desert (see the chapter �The Geologic Origin of the Sonoran Desert�). The sediments transported all the way to the floors of these basins are usually much finer�sands, silts and clays. The mountains themselves possess various rock types, slopes, and exposures that offer a complex array of different soil-forming environments. The monstrous heaps of wind-blown sand in the dune fields of the Gran Desierto in northwestern Sonora and the Cactus Plain east of Parker, Arizona, provide yet another kind of soil parent material. Soils initially form within the physical matrix of the parent material. Over time, the composition and location of substances within the developing soil change and move around, altering the soil�s characteristics. Water is responsible for most of this work of alteration and transportation of materials in soils, even in deserts. Physical and chemical weathering reduces the sizes of coarse particles. Chemical reactions convert some minerals contained in the parent materials into clay minerals. Other chemical reactions paint the soil�s colors. Wind-blown dust and solids dissolved or suspended in raindrops slowly add new materials to the desert�s surface, and water moves some of these materials downward into the soil. Living things residing in and on a soil further influence the soil�s development. All of these processes take time; desert soils that have formed in parent materials that were deposited long, long ago differ considerably from those that have formed in younger deposits. You can readily observe the effect of time on the degree of soil development in alluvial fans deposited at different times throughout the region. Pleistocene deposits (2.4 million to 11,000 years old) may cover the land surface in some places, especially in areas nearer the mountains, while elsewhere, geologically younger Holocene deposits (less than 11,000 years old) are present. The alluvial deposits on the southwest side of the Tortolita Mountains near Tucson provide an example. Water in Wild Burro Wash transported large volumes of gravelly to rocky alluvium out of Wild Burro Canyon and deposited these materials in alluvial fans on the broad, gently sloping piedmont (see the photograph and matching landscape diagram above). Some of these materials were deposited perhaps more than 100,000 years ago, and the surfaces of some of these ancient alluvial fans, although somewhat eroded, still persist. Beneath these old land surfaces are soils that have developed thick, red- colored clayey layers underlain by accumulations of white caliche (defined and discussed below). In contrast, soils in nearby, considerably younger Holocene deposits lack the bright red coloration and accumulations of clay and lime. Soils in both the Pleistocene and Holocene deposits started out with the same kind of parent materials: gravelly to rocky, granitic alluvium almost totally devoid of clay and lime. The great contrast in the amount of time over which the soils have developed is responsible for the differences in soil characteristics. Many soils of the piedmonts and basin floors of the Sonoran Desert start out as deposits of gravelly or stony alluvium which have fairly uniform characteristics throughout. With the passage of time, however, pronounced horizontal layers called soil horizons develop. You can often easily see these horizons in older, well-developed soils because they differ from each other in color. You may also detect them by changes in texture and other characteristics. Soil horizons form in arid and semi-arid regions through the downward transport of materials by water and the accumulation of various materials at characteristic depths. The depth at which materials accumulate depends mostly on how much precip-itation is received (greater amounts of precipitation soaking into the soil transport materials to greater depths) and on the kind of material that is being transported. Many desert soils contain prominent, whitish layers called calcic horizons. These are accumulations of calcium carbonate, the same material found in chalk, concrete, and agricultural lime. In the Sonoran Desert, the tops of these horizons are typically less than twenty to forty inches (50 to 100 cm) below the soil surface. Calcic horizons may be very thin (six inches; 15 cm) in some soils and contain only small amounts of calcium carbonate. In other soils, these horizons may be very thick (greater than three feet; 1 m) and strongly cemented. These nearly impenetrable, cemented layers, or petrocalcic horizons, are commonly called caliche. Calcic horizons are most typically unique features of soils of arid and semi-arid regions and are usually absent from parts of the world receiving much precipitation. The amount of precipitation that infiltrates into the soil is the most important factor that determines the depth to which calcium carbonate is transported and accumulates. In relatively moist parts of the Sonoran Desert, such as areas near Tucson, Arizona, where annual precipitation averages ten inches (25 cm) or more, calcium carbonate tends to accumulate at depths exceeding ten inches (25 cm). In extremely arid regions, though, such as the area around Yuma which annually receives four inches (10 cm) or less precipitation, calcium carbonate may accumulate within a few centimeters of the surface, or even at the surface. In contrast to desert regions, areas such as the eastern United States receive so much rainfall that calcium carbonate never accumulates in pronounced soil horizons, because it is readily leached from the soil and flushed into the groundwater. Thick, strongly-cemented calcic horizons take a long time to form. They start as thin, patchy coats of whitish calcium carbonate on the lower surfaces of pebbles and small stones. In fine-grained parent materials, such as dune sand, that lack coarse materials, calcium carbonate first appears as thin, white, thread-like accumulations where small roots have extracted soil water and caused the calcium carbonate to precipitate. These weakly-developed calcic horizons can form within a few thousand years (see the illustration below). Accumulation of more calcium carbonate eventually produces thicker, continuous coatings on pebbles and stones or pronounced whitish nodules in fine-grained parent materials. Eventually, additional accumulation of calcium carbonate fills the soil interstices between pebbles or nodules and the calcic horizon becomes plugged, greatly restricting the downward movement of water. Once this occurs, calcium carbonate may continue to accumulate on the top of the calcic horizon in hard, cemented layers and may literally engulf and obscure overlying soil horizons in the process (see the photo below). It takes many tens to hundreds of thousands of years for such strongly-developed calcic horizons to form. 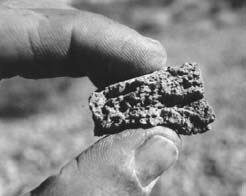 Sometimes hard, whitish caliche becomes exposed on the surfaces of very old soils when erosion removes overlying, less erosion-resistant soil horizons. These partly eroded soils are very common throughout the Sonoran Desert and are called truncated soils. Stages in the development of calcic horizons. For a long time the source of the tremendous amounts of calcium carbonate contained in calcic horizons of desert soils was a mystery. An obvious suggestion was that the original parent materials provided the necessary calcium. This explanation is plausible for parent materials containing limestone and other calcium-rich rocks. However, thick calcic horizons are also found in soils that have formed in parent materials that contain little or no calcium, such as alluvium derived from many igneous rocks or non-calcareous sedimentary and metamorphic rocks. In soils developed in these parent materials, the calcium clearly comes from somewhere else. Another commonly held belief is that groundwater deposited these limy soil layers. Yet calcic horizons are found even in soils where the depth to groundwater exceeds 330 feet (100 m)� even in days before extensive groundwater pumping�and where there is clear evidence that groundwater was far from the surface even during less arid conditions of the last glacial episode more than 11,000 years ago. The answer to the mystery was literally �blowing in the wind.� Atmospheric additions of calcium contained in dust and precipitation are the predominant sources of the calcium contained in calcic horizons of most desert soils. Dust inputs have been measured in desert environments throughout the American Southwest. In a detailed study that spanned a decade in the northern Chihuahaun Desert near Las Cruces, New Mexico, dust traps positioned about thirty-five inches (90 cm) above the soil surface collected an average of more than one ounce (23 g) of dust per square meter surface area per year. The calcium contained in this amount of dust was enough to form the equivalent of about a half gram of calcium carbonate per square meter of ground surface in one year�s time. Piece of strongly cemented calcic horizon ("caliche") removed from soil excavation showing laminations on upper surface. In addition to dust, precipitation also contains dissolved calcium. In the Las Cruces area, two to three times the amount of calcium contained in the deposited dust is delivered to the ground surface dissolved in precipitation. Water moving downward into the soil carries dissolved calcium. Plant roots and other organisms living in the soil respire, producing carbon dioxide which, dissolved in soil water, provides the rest of the chemical building blocks needed to form calcium carbonate. Calcium carbonate precipitates out of solution once the soil begins to dry. Over thousands and thousands of years, the small annual inputs of calcium in dust and precipitation add up to very large accumulations in soil calcic horizons. Some desert soils look like a layered cake with one or more clayey, reddish-brown horizons directly above the white calcic horizon. These clay-rich layers are called argillic horizons, formed over long period of time when clay particles suspended in water are carried downward into the soil and accumulate. Like calcic horizons, the strength of development of argillic horizons depends strongly on soil age. Desert soils formed in materials deposited during the Holocene (less than 11,000 years old) usually lack argillic horizons. Pleistocene deposits that are tens to hundreds of thousands of years old often contain pronounced argillic horizons. Argillic horizons are typically located above calcic horizons, because minute clay particles suspended (but not dissolved) in water are not transported as deeply as is dissolved calcium carbonate (see the photograph below). 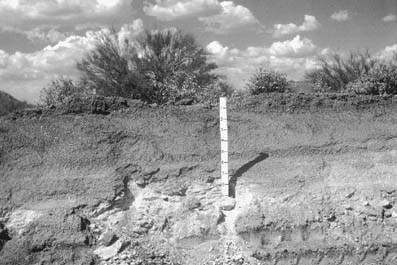 In some of the moister parts of the Sonoran Desert, such as areas around Tucson that annually receive an average of ten inches (250 mm) or more precipitation, argillic horizons of some soils may be more than one and one-half feet (H m) thick and parts may contain more than fifty percent clay. Periods of abundant rainfall can turn these clay-rich layers into sticky traps that can easily mire a vehicle. In contrast, during the dry season, these clay-rich horizons become as hard as adobe brick. When they are dry, strongly developed argillic horizons often have a pronounced prismatic or blocky structure that is a product of repeated swelling and shrinking of the clays. Roadcut in Scottsdale, Arizona on a soil developed in a Pleistocene-ages alluvial fan deposit of granitic gravel. The white scale bar is 1 m long and scaled in decimeters. The whitish calcic horizon is positioned below a reddened, clay-enriched argillic horizon. In more arid parts of the Sonoran Desert, argillic horizons are also present in many soils, but they are not as pronounced; they are much thinner and contain less clay than those found in moister regions. Argillic horizons do not form in certain kinds of parent materials in arid and semi-arid environments. Soils that have formed in calcium carbonate-rich parent materials, such as limestone or exposed calcic horizons of ancient, truncated soils, typically lack argillic horizons. The presence of calcium carbonate apparently causes clay particles to clump together in a way that prevents them from being dispersed in water, thereby inhibiting the downward movement and accumulation of the clays into argillic horizons. Desert soils come in a variety of colors. Some soils have the same pale, brownish color from top to bottom, but others may be layered with browns, reds, pinks, and whites. Argillic horizons of many older soils in the Sonoran Desert are a distinct, rusty brick red. The weathering (oxidation) and accumulation of iron-bearing minerals contained in the soil produce this color. For example, biotite and hornblende are common iron- bearing minerals in parent materials derived from many kinds of igneous and metamorphic rocks. Weathering of these minerals creates new minerals, including the rust-colored iron oxide compounds. As these compounds accumulate, they paint the soil with increasingly strong reddish hues. Very young soils lack accumulations of these iron oxides and are typically pale brown or yellowish-brown. In contrast, soils that have been developing for many tens to hundreds of thousands of years on Pleistocene deposits frequently contain soils with strongly reddened horizons. The degree of reddening that develops within a soil depends strongly on the iron content of minerals in the parent material and on how rapidly the parent materials weather. For example, some granitic rocks with abundant biotite weather very rapidly, producing strongly reddened soils. In some parent materials, the presence of extremely iron-rich minerals such as magnetite or hematite further intensifies red soil colors. Less intense reddening develops in soils derived from parent materials that are relatively poor in iron minerals and are more resistant to weathering. Some soils never develop pronounced red coloration. In deserts, only the slightest reddening of soil horizons occurs in calcareous parent materials derived from limestone, even in old soils. The predominant colors of these soils are light brownish-grays and whites of strongly-developed calcic horizons. Large, flat areas devoid of vegetation and covered by a layer of tightly packed small stones are conspicuous features of extremely arid landscapes. These desert pavements are rare or absent in the moister parts of the Sonoran Desert, but become increasingly pronounced in the driest parts (see the photo below). Closeup of tightly packed stones in a desert pavement. The dark stones are varnish-covered pieces of volcanic rhyolite; the white pieces are quartz on which varnish usually does not form. Some of the most extensive and well-developed areas of desert pavements occur on stony alluvial fan deposits flanking the rugged, low mountains in the extremely arid lower Colorado River Valley. Geologically young deposits (Holocene-aged, less than 11,000 years) lack the flat-surfaced pavements. Surfaces of these young deposits are typically cluttered with large stones and rocks irregularly piled in elevated bars; these low bars are separated by intervening swales. This stony jumble of bars and swales is the topographic imprint of the surface�s creation by the powerful tumult of moving water laden with rocky debris. Over time, though, this imprint disappears as the vertical relief of these coarse, rocky deposits is leveled out, eventually forming the flat pavement of small stones. The best-developed pavements are those that have formed over the passage of several tens of thousands to a few hundreds of thousands of years. Research conducted within the last fifteen years in the Mohave Desert by a team of soil scientists and geologists (L.D. McFadden, S.G. Wells, and M.J. Jercinovich) provides a detailed picture of how desert pavements form on rocky parent materials such as these. Physical weathering of the large rocks on the surface produces the smaller stones that eventually form the pavement surface. These smaller stones tend to accumulate in topographic lows on the original, uneven surface. Special soil characteristics found directly beneath pavements provide clues to an additional process involved in creation of pavements. If you carefully remove the layer of stones from a pavement surface, you will find a distinct, fine-grained soil horizon called a vesicular A (or Av) horizon (see the photograph below). The name �vesicular� refers to the many vesicles or large pores found throughout the horizon. �A� denotes its position as the topmost mineral layer of soil. The Av horizon is typically a few centimeters (about an inch) thick, and contains mostly silts and clays; it lacks coarse materials, even though small stones of the pavement cover the Av horizon and rocky materials occur in the soil underlying it. Side view of a piece of fine-textured Av horizon removed from beneath a desert pavement showing the air-filled vesicles. The origin of the fine-grained Av horizon is an important key to understanding how the overlying flat-topped pavement develops. Examination of the minerals contained in the Av horizon at one site in California demonstrated that the materials in this horizon did not originate from the weathering of the rocky parent materials. Instead, dust deposited on the stony surface is the source of the silts and clays of the Av horizon. These fine-grained materials accumulate beneath a layer of surface stones, separating these stones from the rest of the underlying rocky materials. Over time, the further accumulation of fine-textured materials in the Av horizon literally lifts the mono-layer of stones of the pavement and levels the surface (see the illustration below). Desert pavements are frequently very dark-colored; in many cases they are nearly black. Rock varnish (frequently called desert varnish) on the stone surfaces provides this dark complexion, despite the rock�s internal color. The glossy coatings of desert varnish on stones are very thin, at most a few hundredths of a millimeter thick�about the thickness of a sheet of paper. These thin, lustrous coatings contain a variety of constituents. Clay minerals typically form about three-quarters of the bulk of the varnish and manganese oxides impart the dark color. Many other minerals are present in trace amounts. Desert varnish also contains organic matter, apparently derived from microbial activity. How rock varnish forms is poorly understood. Many of the mineral ingredients of varnish, including clays and manganese, are probably derived from airborne materials that settle on rock surfaces. Bacteria residing on the rock surface may play a major role in concentrating and cementing these materials to form the glossy coatings. Laboratory studies have shown that rock varnish gives off considerable carbon dioxide when moistened, indicating bacterial respiration. However, bacteria are generally absent from the shiny exposed surfaces of varnish, indicating that they reside within and beneath the microscopic varnish layers. The formation of varnish may actually be a means by which these microbes protect themselves in the exposed, extreme environment of a rock surface in the desert. Interestingly, the manganese oxides in rock varnish very effectively block the transmission of ultraviolet radiation. Perhaps the rock-dwelling microbes manufacture their own manganese-formula sun-screen! Rock varnish forms very slowly. Surfaces of some rocks, including many coarse-grained granitic rocks, rarely sport thick coats of varnish because they weather and erode faster than varnish can form. But if rock surfaces resist weathering, varnish coatings become increasingly thick and dark with the passage of time. Rock varnish therefore provides geologists with a valuable tool for determining relative ages of different alluvial fan deposits. Stone surfaces in older deposits are generally covered by thicker, darker coats of varnish. In some cases, the thickest, darkest coatings of varnish found on older deposits may have been accumulating for many tens of thousands to over 100,000 years. Ancient inhabitants of the Sonoran Desert used varnished desert pavements as dark-colored canvases on which they rendered gigantic artistic impressions. By removing the dark varnished stones and exposing the underlying light- colored soil, prehistoric peoples created fantastic images of human figures, animals, and abstract forms. 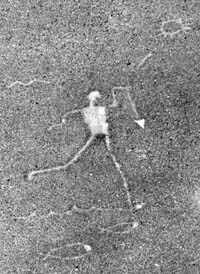 Many of these intaglios or geoglyphs have been discovered in the vicinity of the lower Colorado River Valley near Blythe, California and Ehrenberg, Arizona. Intaglios of the Sonoran Desert are frequently ten yards (10 m) or so long. The largest yet discovered, located about seventy-five miles (120 km) west of Phoenix, is a human figure nearly the length of a football field. These gigantic works of landscape art may have been created well before European colonization of the Americas. We don�t know why the intaglios were created or the purposes they may have served. However, according to legends of indigenous peoples who occupied the area in historic times, some of the giant, human-like figures represent gods or other supernatural beings. The large, skyward-looking images, although usually difficult to recognize from the ground, certainly would be apparent to ancient peoples� deities in skies above. Inhabitants of other desert regions of the world also created intaglios long ago on the surfaces of stone pavements, perhaps for similar reasons. One of the best known examples is located on extensive alluvial fan deposits in the Peruvian coastal desert near Nazca. These intaglios include long, straight lines that are fifteen to twenty miles (24-32 km) long, geometric forms, and images of many kinds of animals. Intaglio (geoglyph) found northeast of Quartsite, Arizona. Rock surfaces covered with dark desert varnish provided prehistoric desert dwellers with another medium for artistic expression. Petroglyphs are designs created by chipping away the surface varnish on large rock and boulder surfaces, exposing lighter-colored rock beneath. These are much, much smaller than the giant intaglios, but similarly include diverse shapes, geometric designs, and human and animal forms. Darkly-varnished desert pavements take so long to form and are extremely sensitive to disturbance. The intaglios created by ancient peoples can last for centuries. So will the uninspiring and less aesthetically appealing tracks so thoughtlessly created in our time by drivers of off-road vehicles. Soils of the desert teem with living things. Plant life ranging from single-celled cyanobacteria to giant saguaro reside on and in the soil. Tunneling termites and burrowing mammals turn over the soil. The activity of some organisms is very ephemeral and occurs in a short span of time after rains. For many others, the soil provides protection from environmental extremes, permitting year-round activity. The survival, growth, and reproduction of living things depends considerably on soil characteristics. Conversely, the activities of organisms living on and in the soil significantly influence the characteristics of soils. Different soil microenvironments support different kinds of microphytic crusts. In the Sonoran Desert, larger lichens, mosses, and liverworts are more common on slopes with northern exposures; these retain moisture for longer periods after rainfall. In some fine-grained soils on the floors of basins in the hottest, driest parts of the Sonoran Desert, the dark- colored soil surface is due to the presence of untold millions of cyanobacteria or �blue-green algae.� These dark cyanobacterial crusts lie dormant most of the time but are physiologically �awakened� when the soil surface is wetted. After a rain, these organisms typically remain active for only a day or two before the soil surface again dries. Microphytic soil crusts significantly affect soils. Cyanobacteria create sticky materials that bind soil particles together. Threadlike structures called hyphae, produced by the symbiotic fungi of lichens, knit the soil together, making it more resistant to erosion by the intense splashes of thunderstorm raindrops. Cyanobacteria can fix atmospheric nitrogen, thereby adding nitrogen to the soil in a form that potentially can be used by larger plants. Like desert pavements, these living crusts can easily be destroyed by human activities. Mechanical disturbance by recreational vehicles poses a significant threat in all desert regions of the American Southwest. Excessive livestock trampling can also greatly damage microphytic crusts. Once destroyed, recovery of some kinds of microphytic crusts can be very slow, taking decades to perhaps a century or more. Soil conditions directly affect many kinds of desert animals. For burrowing animals, the choice of a place to excavate a living shelter may depend on soil texture. For example, in the Mohave Desert, desert tortoises apparently require soils that are loose enough to be excavated, but firm enough so that the burrows will not collapse. Consequently, in areas containing both extremely sandy soils versus loamy soils with higher clay content, tortoises tend to construct their burrows in the loamy soils. Different kinds of soil horizons may physically impede burrowing activities of some animals. For example, the mound-like burrows of Merriam�s kangaroo rat (Dipodomys merriami) frequently are found beneath the canopy of a large creosote bush (Larrea tridentata) in sandy to loamy soils that lack substantial development of argillic or calcic horizons. However, on soils with extremely shallow, strongly cemented calcic horizons, this species of kangaroo rat is usually absent or rare, probably because of the difficulty of excavating burrows in these soils. Soil texture may also affect some animals by controlling the availability of water. Two similar species of large, seed harvester ants of the Sonoran Desert (Pogonomyrmex rugosus and Messor pergandei) tend to occupy soils that differ slightly in clay content. P. rugosus is usually found in soils with higher clay contents than those occupied by Messor pergandei. The reasons for this separation are not well understood, but perhaps the influence of soil texture on the infiltration and availability of water affect the two species in different ways. The soil directly beneath perennial plant canopies is enriched with organic matter and nutrients, compared to bare areas between plants. Beneath plant canopies, organic materials are buried by the burrowing activities of mammals, and dead plant roots provide abundant organic matter on which many small animals feed. In this case, ecological wealth generates more wealth, and these �fertile islands� foster considerably higher densities and increased activity of small animals living on and in the soil. Two groups of very small animals, arthropods and nematodes, are abundant in desert soils, especially in the fertile islands beneath plant canopies. Comparatively speaking, some of these animals are relatively large, such as the .04 to .06 inch (1-2 mm) long springtails (order Collembola), small insects that reside in leaf litter. Myriads of others, including many kinds of mites and nematodes, are extremely small, requiring a microscope to see them. Different species of soil mites play a variety of ecological roles. Many are scavengers that feed on decomposing plant and animal material. Others are herbivores that pierce cells of plant roots with their mouthparts to drain the contents. Some are carnivores that feed on other small arthropods, other mites, and nematodes. Soil nematodes, or microscopic roundworms, are equally varied in the ecological roles they play. Some consume bacteria and other microbes; others subsist on fungi or plants or are omnivorous; some are micropredators. In turn, nematodes are the prey of other small animals, such as predaceous mites. One team of scientists estimated that the top twelve inches (30 cm) of soil at a site in the Mohave Desert contained slightly over one million nematodes per square meter (10.7 ft2). However, this tremendous number of microscopic roundworms amounted to less than .0035 ounce (1/10 gram) dry weight. Other surveys indicate similar abundances of soil nematodes in the Sonoran Desert. The minute soil arthropods and nematodes, together with the plant foods and organic matter they consume, form complex food webs of producers, prey, and predators. The operation of this web continuously recycles mineral nutrients between living and non-living components of the desert ecosystem. Larger animals that tunnel and burrow in the soil, including termites and many kinds of rodents, are biological bulldozers. Their excavations can significantly affect characteristics of desert soils. The excavation and turnover of soil by many seed-eating rodents, such as Merriam�s kangaroo rat, creates more porous soils into which water more easily infiltrates. The increased soil permeability created by the excavations of some kinds of kangaroo rats may actually benefit creosote bush plants growing on the mound-like burrow systems. In the warm deserts of the American Southwest, termites are perhaps the greatest earth-movers. Subterranean termites transport a tremendous amount of relatively deep soil materials to the surface when they construct their mud-covered tunnels on the soil surfaces and on the cellulose-containing foods they consume. In this way, desert termites accomplish the same kind of ecological role as do earthworms in soils of moister regions. In the Chihuahuan Desert of southern New Mexico, a group of ecologists estimated that termites annually brought over 1760 pounds (800 kg) of soil materials per two and one-half acres (1 hectare) to the soil surface. Termite activity in some parts of the Sonoran Desert is probably comparable. This tremendous turnover of the soil can greatly affect the formation of soil horizons and the distribution of clay, calcium carbonate and other materials. In southern New Mexico, this turnover of soil by termites has apparently thoroughly mixed soil horizons of some older soils, obliterating distinct zones of clay accumulation in argillic horizons. The availability of water usually poses the single greatest limitation to plant life in deserts. Although desert environments are defined by the amount of precipitation received, the amount of moisture that is available for plants to use is modified by features of the soil. Subtle changes in permeability and texture affect how much precipitation is either absorbed by the soil or lost to runoff, and how deeply water infiltrates into the soil. The different soil horizons discussed earlier affect infiltration and depth of water storage. Relatively large quantities of water can soak into the surface of a sandy-gravelly soil that lacks horizon development. A significant fraction of rainfall may infiltrate to perhaps a meter in such a deep, permeable soil. Water stored deeply is protected from evaporation to the atmosphere. In contrast, clayey argillic horizons of well-developed soils can hold much more water than sandy layers. As a consequence, clayey soil layers absorb much water as it moves downward, greatly limiting deeper infiltration of water. Shallow soil moisture is more readily lost to evaporation. The different kinds of soil water reservoirs (deep versus shallow) vary in their persistence throughout the year. Various perennial plant species respond differently to these contrasting soil moisture conditions. Some species are better suited to soils that foster deep infiltration; others have ways to cope with the extreme seasonal fluctuations of shallow soil moisture. For example, in the Arizona Upland subdivision of the Sonoran Desert where average annual precipitation generally exceeds eight inches (20 cm), soils on Pleistocene-aged alluvial fan surfaces that have strongly developed argillic horizons are covered by perennial vegetation that is very different from the vegetation on nearby Holocene surfaces or on erosionally truncated soils. Creosote bush is typically the dominant plant species on soils lacking argillic horizons on Holocene fan surfaces. The relatively deep root system of this plant enables it to extract water from deep in the soil. Although creosote bush also contains abundant shallow roots, the supply of the more constant (although typically meager), deeper supplies of water allows this evergreen shrub to remain active throughout the entire year, even during extended rainless periods when shallow soil moisture has largely disappeared. Creosote bush is also often the dominant species on erosionally truncated soils with shallow, calcic horizons. Some deep water is available in these soils due to cracks and fissures within the otherwise hard, impenetrable layers of caliche. In contrast, creosote bush is often rare or even absent from soils with thick, strongly developed argillic horizons. 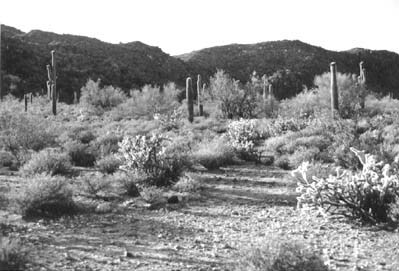 The principal occupants of these soils are usually triangleleaf bursage (Ambrosia deltoidea), and cacti, including staghorn and buckhorn chollas (Opuntia acanthocarpa and O. versicolor). These plants have relatively shallow roots and are capable of quickly using shallow soil water when it is briefly available and then surviving lengthy periods when it is not. Triangleleaf bursage survives during long dry periods by shedding its leaves and becoming dormant (a condition called drought dormancy). In the cacti, water stored in succulent tissues enables the plants to continue photosynthetic activity past the time when water no longer can be extracted by roots. Vegetation dominated by triangleleaf bursage and buckthorn cholla on soil with well-developed argillic horizon on Pleistocene-aged alluvial fan deposit. Harquahala Mountains, Arizona. In the extremely arid parts of the Sonoran Desert, some soil horizons may reduce the infiltration of water to the extent that no perennial plants can survive. Beneath stone pavements, the silts and clays of Av horizons can soak up a considerable amount of moisture, preventing water from passing to deeper parts of the soil. Even in the case of the occasional storm that delivers large amounts of rain, once the fine-textured Av horizon is saturated, very little additional water can soak into the soil surface and the abundant rainfall is quickly lost as runoff. The shallow moisture below the pavement then quickly evaporates, preventing occupancy of the surface by perennial plants. The shallow infiltration of water into pavement soils also creates another soil condition that makes some desert pavements extremely inhospitable to many plants. Because water seldom, if ever, infiltrates far beneath the surface, large quantities of salts, including sodium chloride, tend to accumulate near the surface. In the vicinity of Yuma, Arizona, salt contents in some soils directly beneath varnished pavements have been measured and are about thirty times higher than salt content of nearby soils lacking pavements. Most common perennial plants of the Sonoran Desert cannot tolerate such salt concentrations, especially when combined with the scarcity of water. The large amount of runoff from desert pavements concentrates in shallow runnels and washes cut into the pavement surface. In these places where the stone pavement and Av horizon are absent, water has a chance to soak into the soil, sustaining sinuous lines of creosote bush, bursage, ocotillo, palo verde, and desert ironwood that weave across the otherwise barren pavements. Throughout the expanses of the Sonoran Desert in Arizona, California, Sonora, and Baja California, you will see many places where the character of the vegetation abruptly changes. Differences in soils, often subtle, but sometimes pronounced, and the way soil characteristics influence soil water, are responsible for much of this compositional complexity in the Sonoran Desert. Bassett, C.A. �Lonely Giants.� Arizona Highways 65: 38-45 (1989). Chew, R.M. and W.G. Whitford. �A Long-term Positive effect of kangaroo rats (Dipodomys spectabilis) on creosotebushes (Larrea tridentata).� Journal of Arid Environments 22: 375-386 (1992). Drake, N.A., M.T. Heydeman and K.H. White. �Distribution and formation of rock varnish in southern Tunisia.� Earth Surface Processes and Landforms 18: 31-41 (1993). ���. �Causes of soil boundaries in an arid region: II. Dissection, moisture, and faunal activity.� Soil Science Society of America Proceedings 39: 324-330 (1975). Gile, L.H., J. W. Hawley and R.B. Grossman. �Soils and Geomorphology in the Basin and Range Area of Southern New Mexico,� Guidebook to the Desert Project. Memoir 39, Socorro, New Mexico: New Mexico Bureau of Mines and Mineral Resources, 1981. Gile, L.H. and R.B. Grossman. �Morphology of the argillic horizon in desert soils of southern New Mexico.� Soil Science 106: 6-15 (1968). Gile, L.H., F.F. Peterson and R.B. Grossman. �Morphological and genetic Sequences of carbonate accumulation in desert soils.� Soil Science 101: 347-360 (1966). Johnson, R.A. �Soil texture as an influence on the distribution of the desert seed- harvester Ants Pogonomyrmex rugosus and Messor pergandei.� Oecologia 89: 118-124 (1992). McAuliffe, J.R. �The Sonoran Desert: Landscape complexity and ecological diversity.� Ecology of Sonoran Desert Plants and Plant Communities. R. Robichaux, ed. Tucson: University of Arizona Press, 1999. ���. �Landscape evolution, soil formation, and ecological patterns and processes in Sonoran Desert Bajadas.� Ecological Monographs 64: 111-148 (1994). McFadden, L.D., S.G. Wells and M.J. Jercinovich. �Influences of eolian and pedogenic processes on the origin and evolution of desert pavements.� Geology 15: 504-508 (1987). Peterson, F.F. �Landforms of the Basin and Range Province Defined for Soil Survey.� Nevada Agricultural Experiment Station Technical Bulletin 28 (1981). Polis, G.A., ed. The Ecology of Desert Communities. Tucson: University of Arizona Press, 1991. 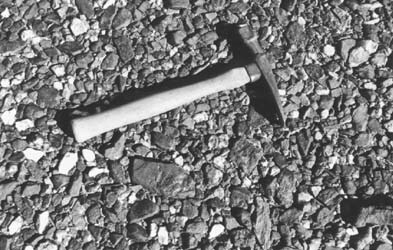 VandenDolder, E.M. �Rock varnish and desert pavement provide geological and archaeological records.� Arizona Geology 22(1): 1, 4-7 (1992). Weide, D. L., ed. Soils and Quaternary Geology of the Southwestern United States. GSA Special Paper 203. Boulder: Geological Society of America, 1985. West, N.E. �Structure and function of microphytic soil crusts in wildland ecosystems of arid to semi-arid regions.� Advances in Ecological Research 20: 179-223 (1990).